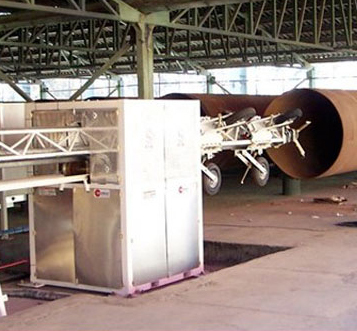 Modular design and transportable semi-automatic pipe coating machine.The pipe coating boom system comprises of 3x 6m (18ft) triangulated boom sections which can be further extended if required. A variable speed drive unit allows accurate control of boom recovery and coating speed providing a high quality finish to be achieved. Optional coating head and support systems can be installed depending on pipe diameter. The system is best operated in conjunction with CoverCat computerised control equipment. The equipment can be set up to apply PU – rapid setting polymeric lining systems, or epoxy resins, as notified to CoverCat at the time of manufacture, for a wide range of mix ratios. The systems are typically Trailer or Skid mounted and comprise; Positive displacement metering pump with component material reservoirs, Heating systems, Computer controlled monitoring system, Umbilical lining hoses, In-line mixer and Spray application head. The units are manufactured to meet the demands of handling rapid cure and filled materials mixing and gelling within 60 seconds.